During March, with St. Patrick's day being a huge celebration whether you're Irish or not, it's nice to have a good Irish meal. I usually opt for corn beef and cabbage, but this year I went for something different. I'm glad I did too. 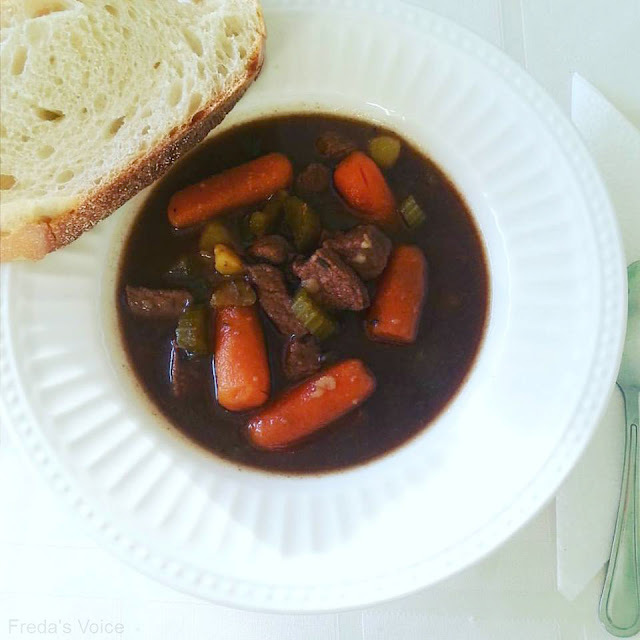 It has a flavor that is delicious and not like regular beef stew. Put the pepper and garlic powder in a bowl, then season the beef. Using the decent size pot you will cook with, brown the beef in a little olive oil. When it's dead and pink no more, you add the remaining ingredients and cook it about an hour, till the vegetables are soft. Serve with a warm bread. Irish Soda bread, if you have it, if not baguette is yummy too. **No compensation was received for posting. The recipe and photo are owned by Freda's Voice. Yum! I'm trying this soon. Pinning it! Sounds perfect! I am pinning too! Of all the recipes I saw floating around with Guiness, this one looks awesome!